The grooms demonstrate their prowess on the dance floor with a dance medley to Gloria Estefan, Madonna, and "(I've Had) The Time of My Life." 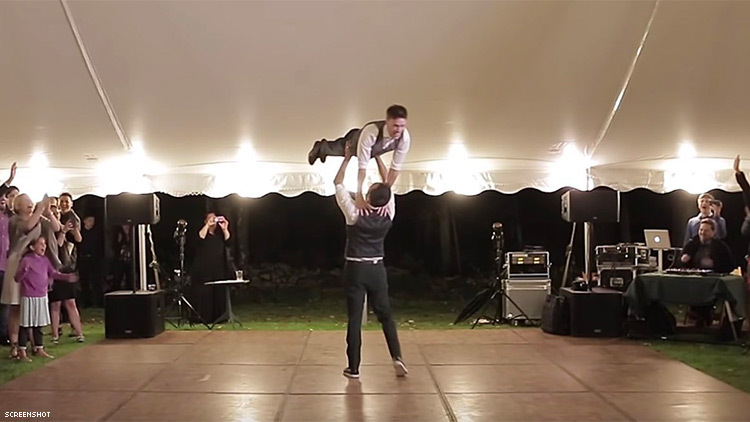 A couple of grooms wowed their wedding guests with their first dance when they were married a while back, but now that the video clip of their epic mash-up that culminates with the signature song and moves from Dirty Dancing has been uploaded, the infectious video is going viral. “We seriously did have “the time of our lives … An incredible night surrounded by incredible people!” PJ and Noah wrote on YouTube about their wedding.